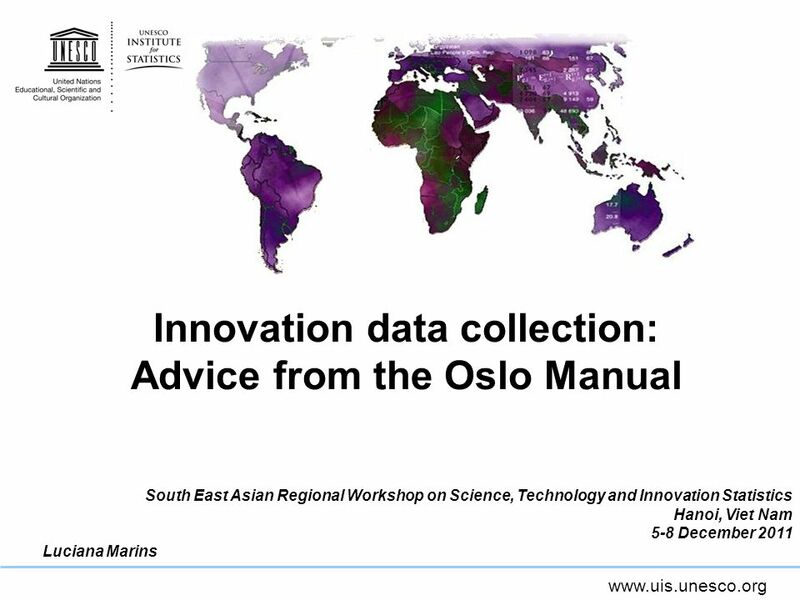 Www.uis.unesco.org Innovation data collection: Advice from the Oslo Manual South East Asian Regional Workshop on Science, Technology and Innovation Statistics. 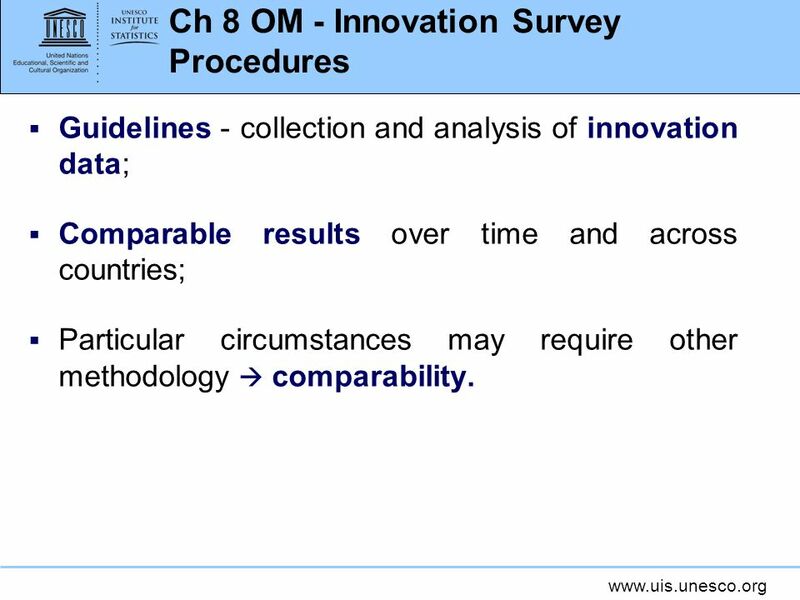 2 www.uis.unesco.org Ch 8 OM - Innovation Survey Procedures Guidelines - collection and analysis of innovation data; Comparable results over time and across countries; Particular circumstances may require other methodology comparability. 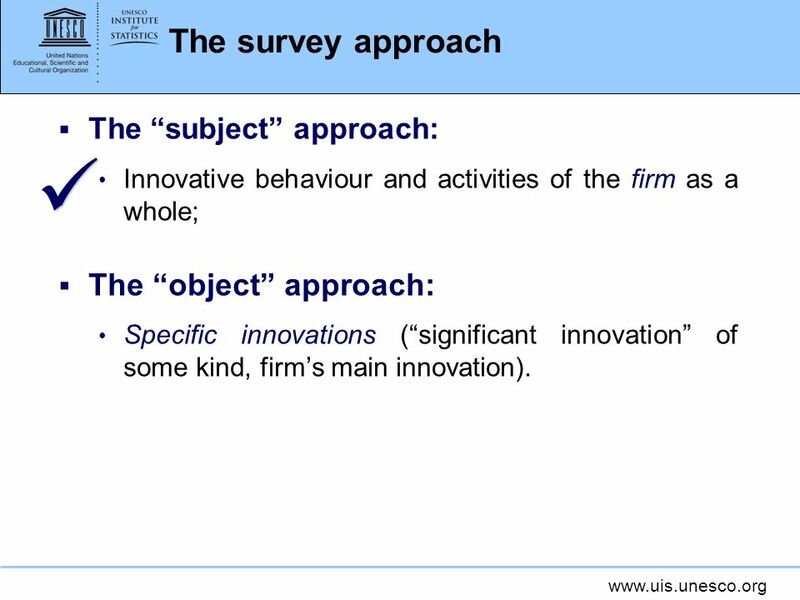 3 www.uis.unesco.org The survey approach The subject approach: Innovative behaviour and activities of the firm as a whole; The object approach: Specific innovations (significant innovation of some kind, firms main innovation). 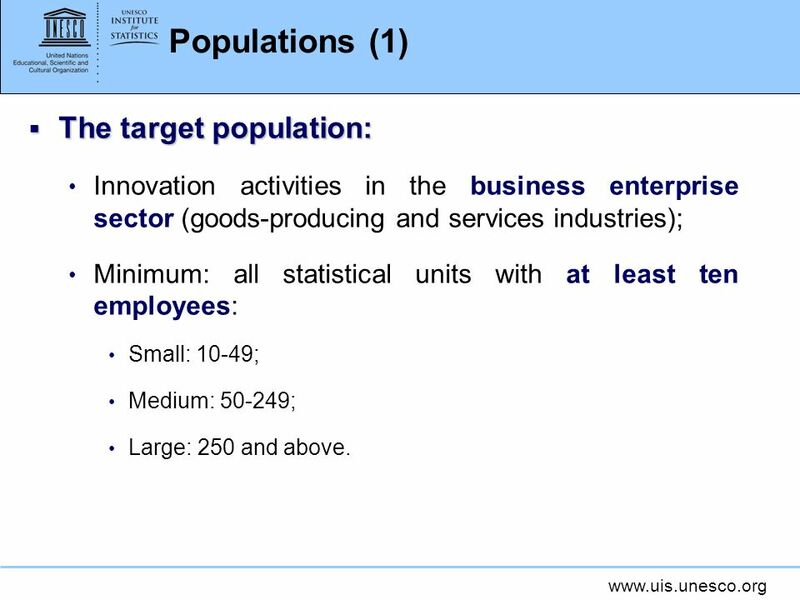 4 www.uis.unesco.org Populations (1) The target population: The target population: Innovation activities in the business enterprise sector (goods-producing and services industries); Minimum: all statistical units with at least ten employees: Small: 10-49; Medium: 50-249; Large: 250 and above. 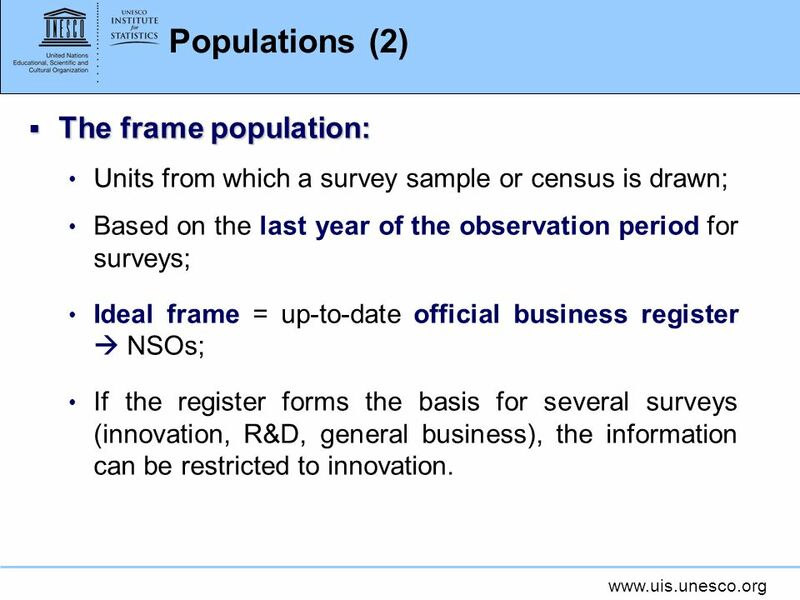 5 www.uis.unesco.org Populations (2) The frame population: The frame population: Units from which a survey sample or census is drawn; Based on the last year of the observation period for surveys; Ideal frame = up-to-date official business register NSOs; If the register forms the basis for several surveys (innovation, R&D, general business), the information can be restricted to innovation. 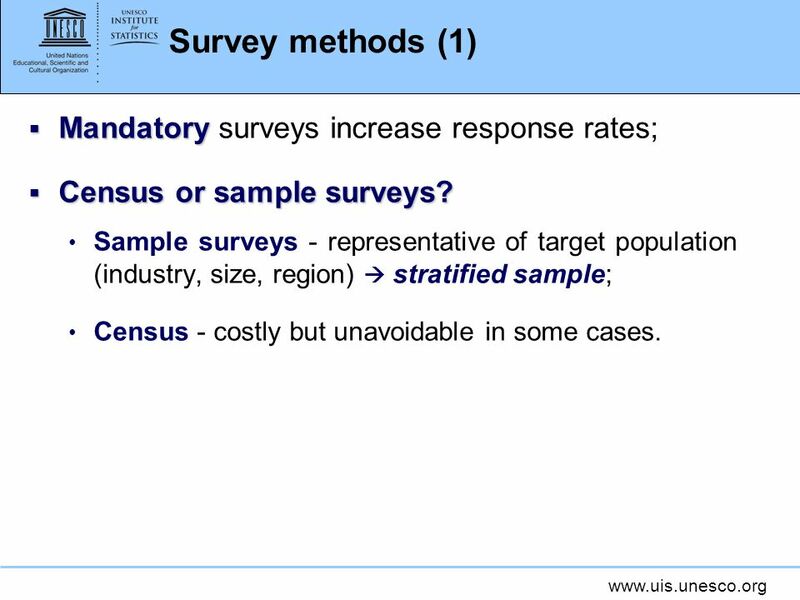 6 www.uis.unesco.org Survey methods (1) Mandatory Mandatory surveys increase response rates; Census or sample surveys? Census or sample surveys? Sample surveys - representative of target population (industry, size, region) stratified sample; Census - costly but unavoidable in some cases. 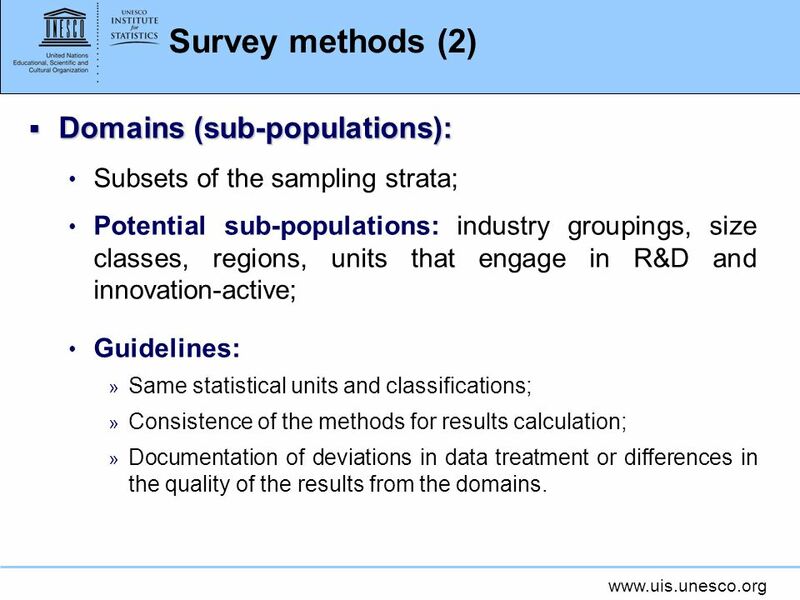 7 www.uis.unesco.org Survey methods (2) Domains (sub-populations): Domains (sub-populations): Subsets of the sampling strata; Potential sub-populations: industry groupings, size classes, regions, units that engage in R&D and innovation-active; Guidelines: » Same statistical units and classifications; » Consistence of the methods for results calculation; » Documentation of deviations in data treatment or differences in the quality of the results from the domains. 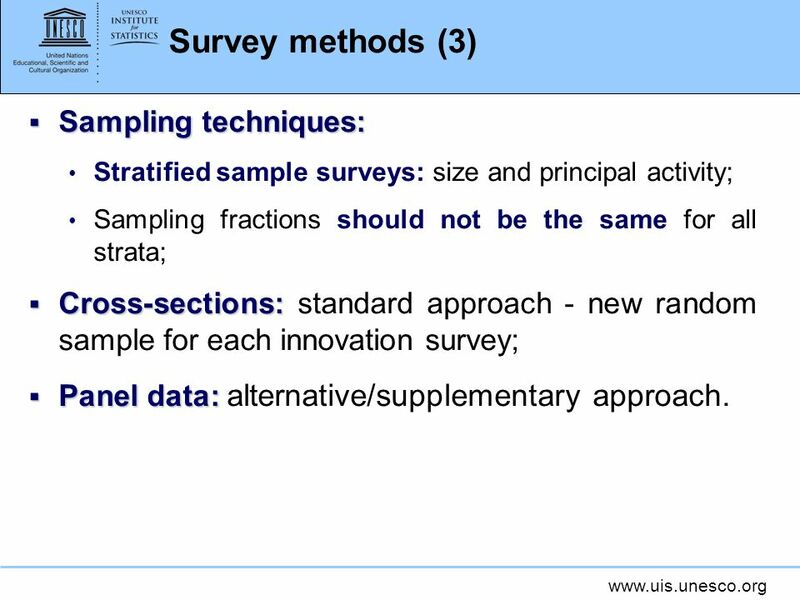 8 www.uis.unesco.org Survey methods (3) Sampling techniques: Sampling techniques: Stratified sample surveys: size and principal activity; Sampling fractions should not be the same for all strata; Cross-sections: Cross-sections: standard approach - new random sample for each innovation survey; Panel data: Panel data: alternative/supplementary approach. 9 www.uis.unesco.org Survey methods (4) Suitable respondents: Suitable respondents: Methods - ex: postal surveys, personal interviews; Units most suitable respondent - very specialised questions that can be answered by only a few people; Try to identify respondents by name before data collection starts. 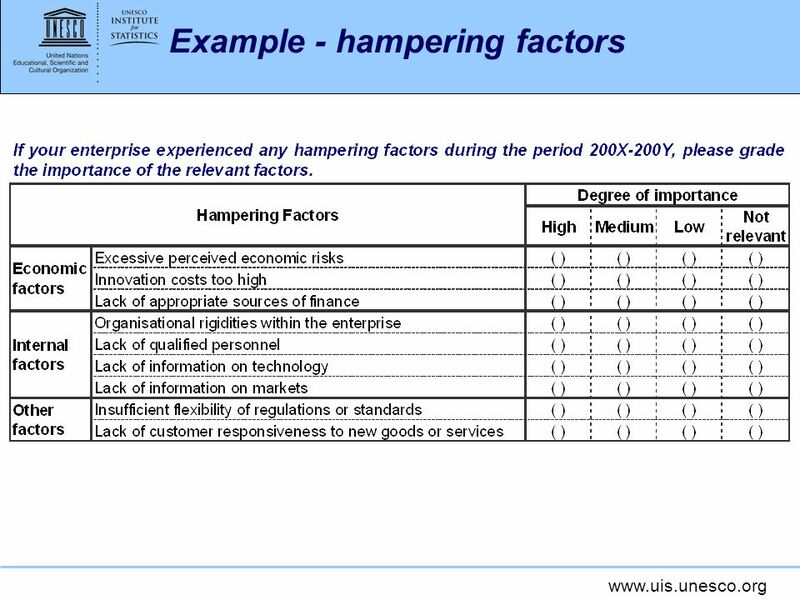 Try to identify respondents by name before data collection starts. 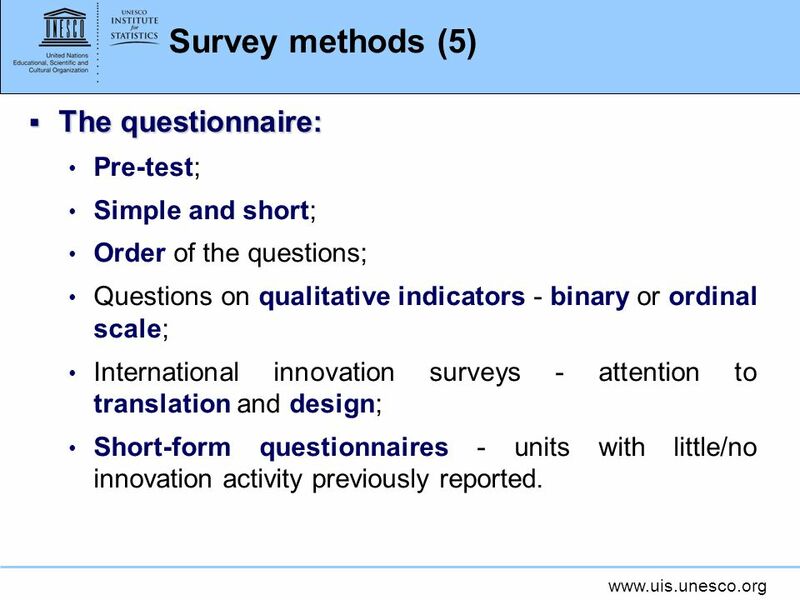 10 www.uis.unesco.org Survey methods (5) The questionnaire: The questionnaire: Pre-test; Simple and short; Order of the questions; Questions on qualitative indicators - binary or ordinal scale; International innovation surveys - attention to translation and design; Short-form questionnaires - units with little/no innovation activity previously reported. 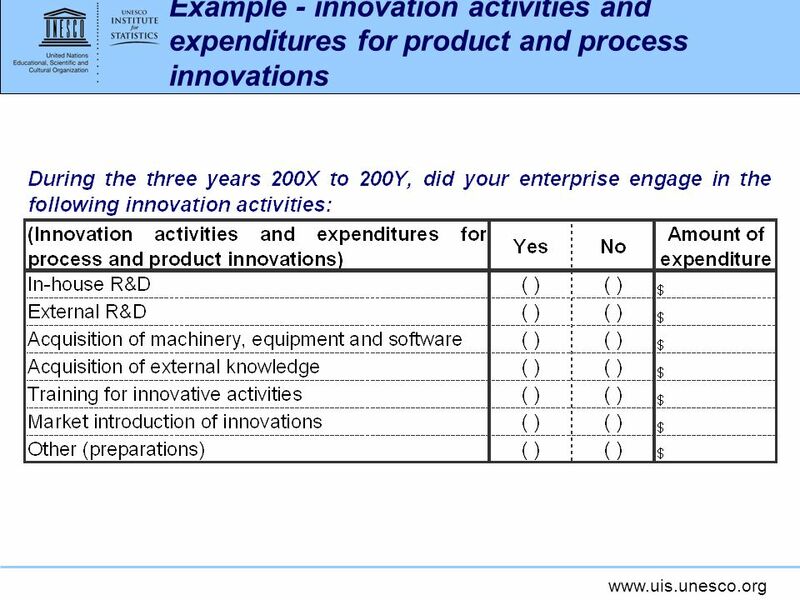 11 www.uis.unesco.org Survey methods (6) Combination of Innovation and R&D surveys: Combination of Innovation and R&D surveys: Reduction in the overall response burden; Scope for analysing the relations between R&D and innovation activities; Increase in the frequency of innovation surveys; Country experiences - it is possible to obtain reliable results for R&D expenditures; Longer questionnaire; Units not familiar with the concepts of R&D and innovation may confuse them; Different frames for the two surveys. 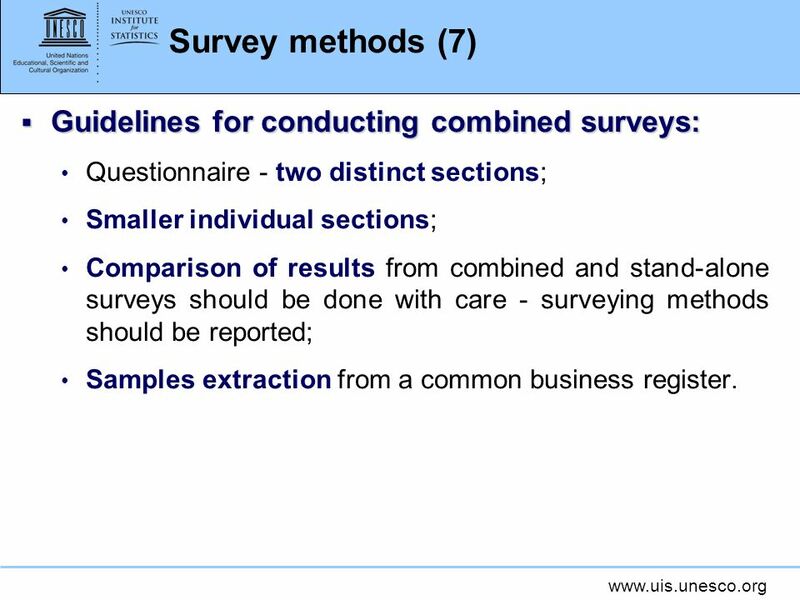 12 www.uis.unesco.org Survey methods (7) Guidelines for conducting combined surveys: Guidelines for conducting combined surveys: Questionnaire - two distinct sections; Smaller individual sections; Comparison of results from combined and stand-alone surveys should be done with care - surveying methods should be reported; Samples extraction from a common business register. 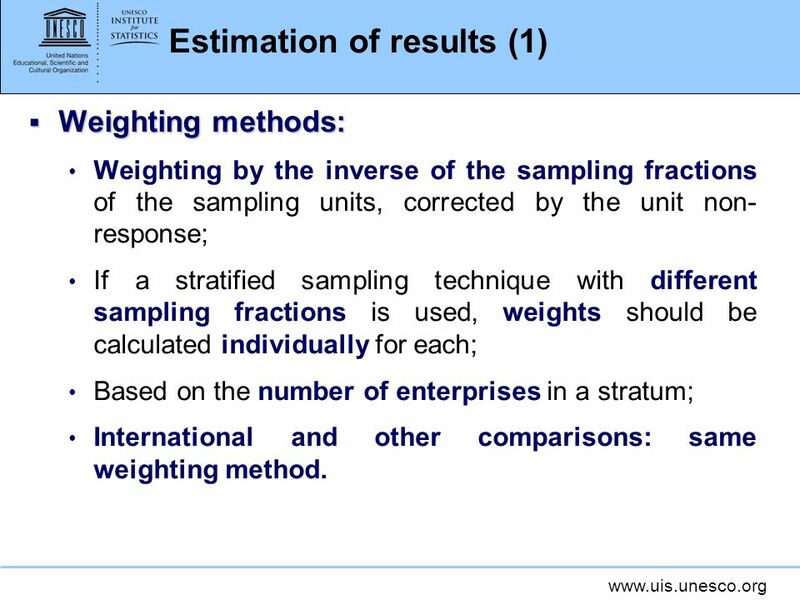 13 www.uis.unesco.org Estimation of results (1) Weighting methods: Weighting methods: Weighting by the inverse of the sampling fractions of the sampling units, corrected by the unit non- response; If a stratified sampling technique with different sampling fractions is used, weights should be calculated individually for each; Based on the number of enterprises in a stratum; International and other comparisons: same weighting method. 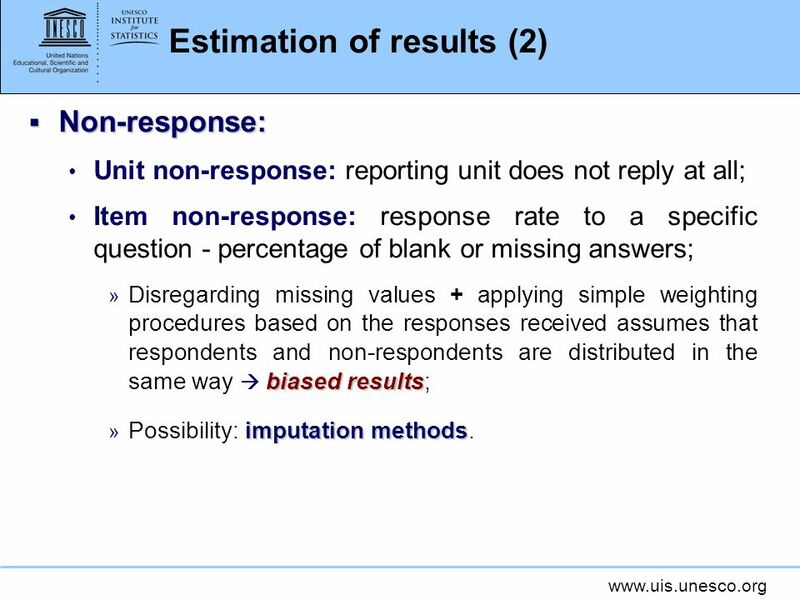 14 www.uis.unesco.org Estimation of results (2) Non-response: Non-response: Unit non-response: reporting unit does not reply at all; Item non-response: response rate to a specific question - percentage of blank or missing answers; biased results » Disregarding missing values + applying simple weighting procedures based on the responses received assumes that respondents and non-respondents are distributed in the same way biased results; imputation methods » Possibility: imputation methods. 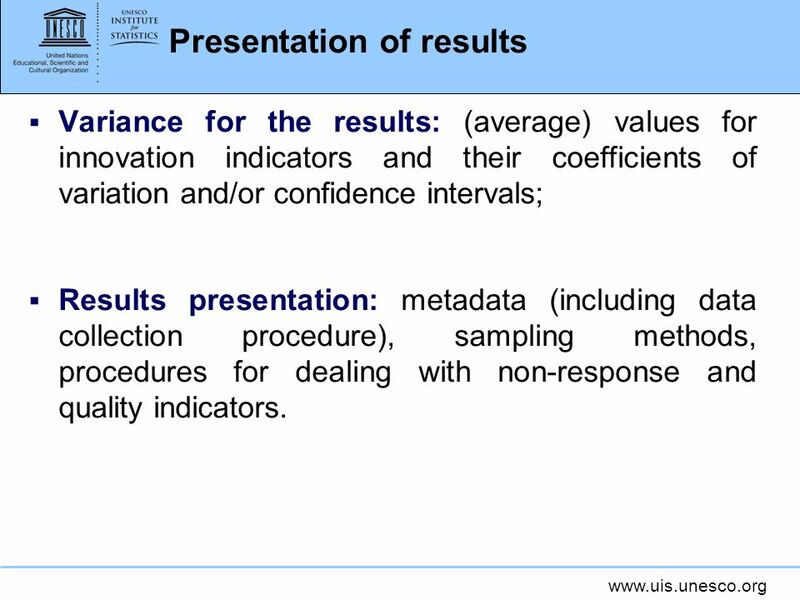 15 www.uis.unesco.org Presentation of results Variance for the results: (average) values for innovation indicators and their coefficients of variation and/or confidence intervals; Results presentation: metadata (including data collection procedure), sampling methods, procedures for dealing with non-response and quality indicators. 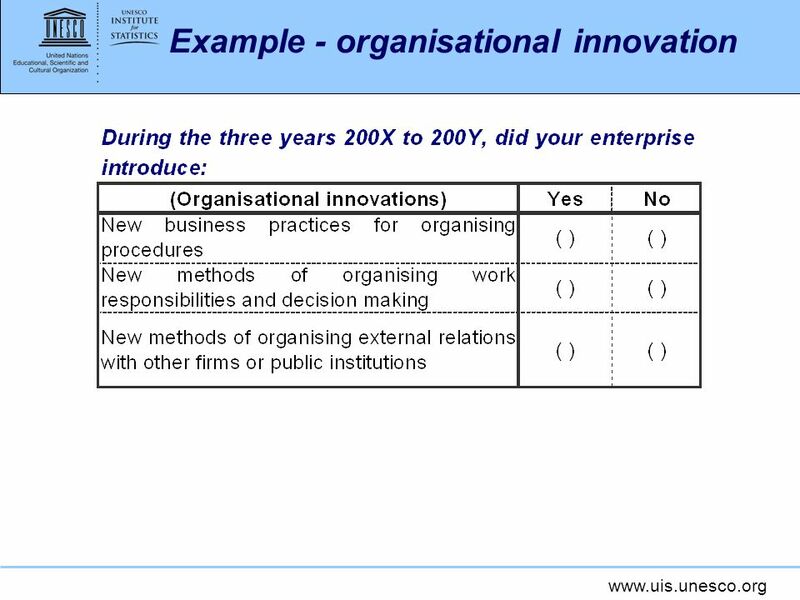 16 www.uis.unesco.org Frequency of data collection Every two years; If not economically feasible frequency of three or four years; Specify an observation period; The length of the observation period for innovation surveys should not exceed three years nor be less than one year. 17 www.uis.unesco.org Annex A - 5. 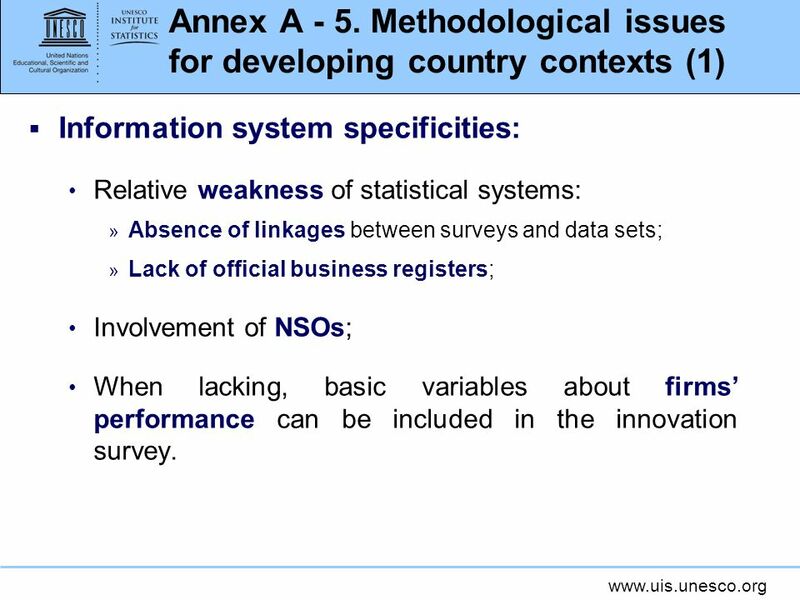 Methodological issues for developing country contexts (1) Information system specificities: Relative weakness of statistical systems: » Absence of linkages between surveys and data sets; » Lack of official business registers; Involvement of NSOs; When lacking, basic variables about firms performance can be included in the innovation survey. 18 www.uis.unesco.org Annex A - 5. 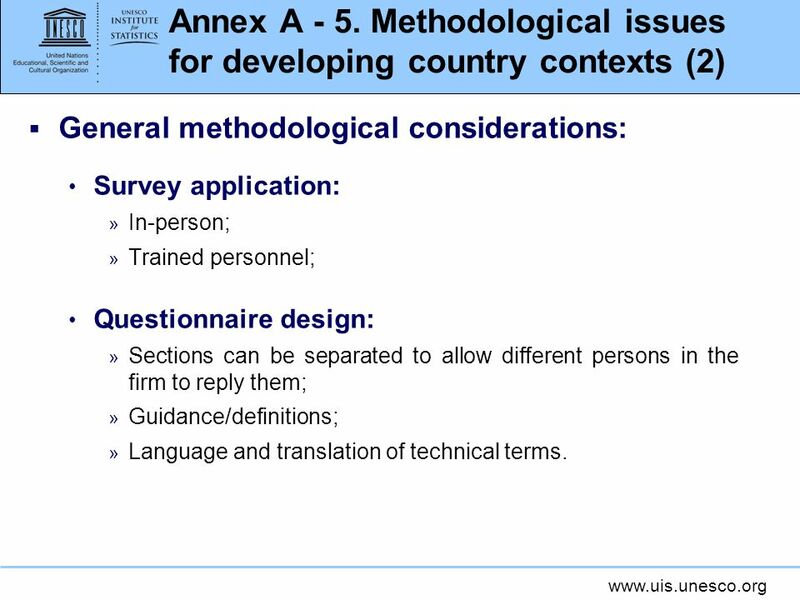 Methodological issues for developing country contexts (2) General methodological considerations: Survey application: » In-person; » Trained personnel; Questionnaire design: » Sections can be separated to allow different persons in the firm to reply them; » Guidance/definitions; » Language and translation of technical terms. 19 www.uis.unesco.org Annex A - 5. 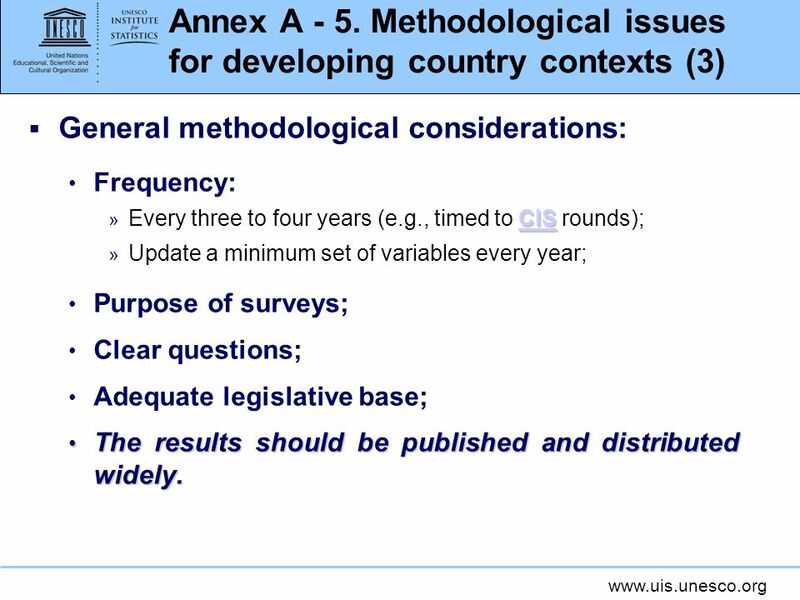 Methodological issues for developing country contexts (3) General methodological considerations: Frequency: CIS CIS » Every three to four years (e.g., timed to CIS rounds);CIS » Update a minimum set of variables every year; Purpose of surveys; Clear questions; Adequate legislative base; The results should be published and distributed widely. The results should be published and distributed widely. 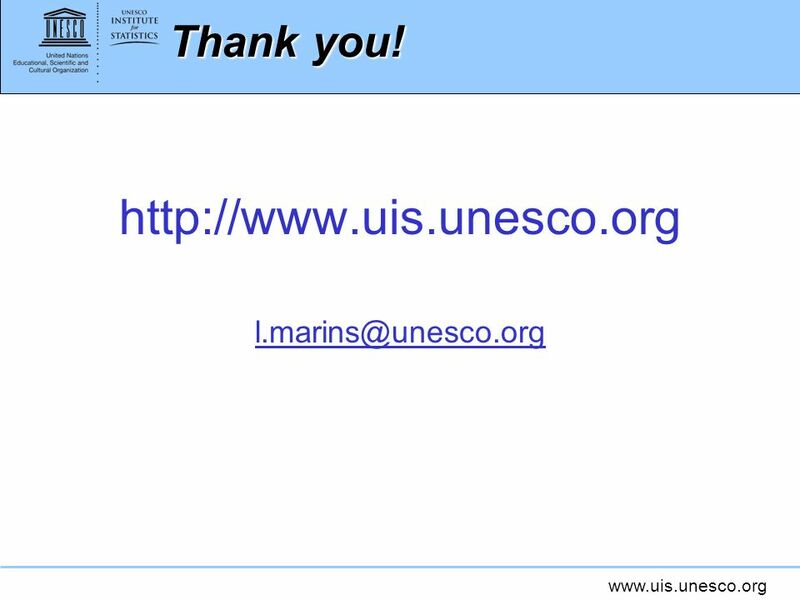 Download ppt "Www.uis.unesco.org Innovation data collection: Advice from the Oslo Manual South East Asian Regional Workshop on Science, Technology and Innovation Statistics." Introduction to UIS data collection tools and guidelines TRAINING WORKSHOP ON SCIENCE, TECHNOLOGY AND INNOVATION INDICATORS Cairo, Egypt. Measuring innovation SUB-REGIONAL HANDS-ON TRAINING ON SCIENCE, TECHNOLOGY AND INNOVATION INDICATORS Damascus, Syria September 2010. Innovation data collection: Methodological procedures & basic forms Regional Workshop on Science, Technology and Innovation (STI) Indicators. Measuring innovation: Main definitions - Part II South East Asian Regional Workshop on Science, Technology and Innovation Statistics. Measuring innovation CENTRAL ASIAN SUB-REGIONAL CONSULTATION MEETING ON SCIENCE, TECHNOLOGY AND INNOVATION (STI) STATISTICS AND INDICATORS Tashkent, Uzbekistan. Introduction to UIS data collection tools and guidelines West Africa Regional Science, Technology and Innovation Policy Reviews and. The UIS strategy for collecting innovation indicators South East Asian Regional Workshop on Science, Technology and Innovation Statistics. Innovation Surveys: Advice from the Oslo Manual National training workshop Amman, Jordan October 2010. 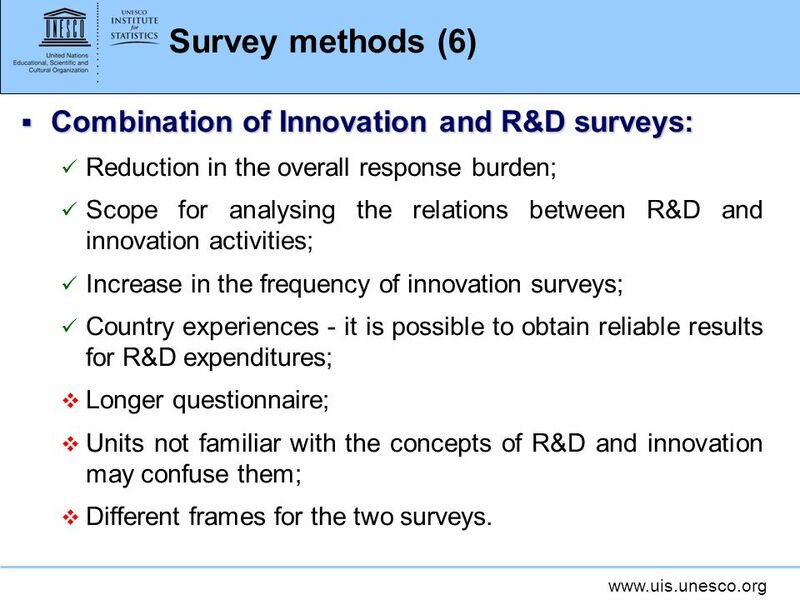 R&D Surveys: Advice from the Frascati Manual National training workshop Amman, Jordan October 2010. Improving Statistical Systems: Advice from the UIS Technical Guide National training workshop Amman, Jordan October 2010. How to run an R&D survey and setting up and strengthening R&D statistical systems NATIONAL TRAINING WORKSHOP ON SCIENCE, TECHNOLOGY. Measuring innovation South Asian Regional Workshop on Science, Technology and Innovation Statistics Kathmandu, Nepal 6-9 December 2010. The UIS strategy for the collection and development of innovation indicators South Asian Regional Workshop on Science, Technology and. Introduction to UIS data collection tools and guidelines South East Asian Regional Workshop on Science, Technology and Innovation Statistics. Measuring innovation CARIBBEAN REGIONAL WORKSHOP ON SCIENCE, TECHNOLOGY AND INNOVATION (STI) INDICATORS St Georges, Grenada 1-3 February. Survey design. What is a survey?? Asking questions – questionnaires Finding out things about people Simple things – lots of people What things? What people? ESRC UK Longitudinal Studies Centre A Framework for Quality Profiles Nick Buck and Peter Lynn Institute for Social and Economic Research University of. Www.uis.unesco.org Introduction to UIS data collection tools and guidelines TRAINING WORKSHOP ON SCIENCE, TECHNOLOGY AND INNOVATION INDICATORS Cairo, Egypt.